If you are a chocolate lover like myself then you will love this recipe. It is so delicious. Everything about this recipe is spot on. I couldn’t believe it when I first saw this at my daughter’s house. She really found a recipe that was a keeper. The recipe is really rich so make sure that you have a frosty glass of milk nearby! You will want to rinse this scrumptious cake down with something other than chocolate. This is a recipe that can make a sleepover go from good to FANTASTIC! Try this out with your family and you will see how much they love this sweet treat. This s’more lava cake is so rich and moist that I can’t help but eat almost the whole thing! 1. Grease slow cooker with cooking spray. 2. Prepare cake mix as directed on box in a medium mixing bowl. 3. Prepare pudding mix as directed on box in a small mixing bowl. 4. 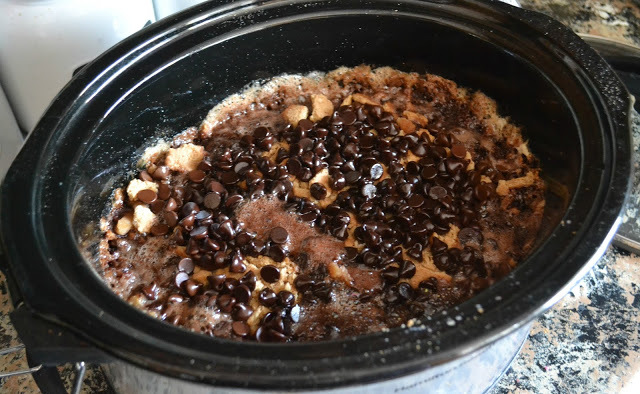 Pour prepared cake mix into slow cooker. 5. Cover cake mix with mini marshmallows. 6. Carefully spread chocolate pudding mix over the marshmallows. 7. Evenly top the pudding with graham crackers and chocolate chips. 8. Cook cake on low for 3 hours. Enjoy when cake is warm and bubbly. Quick Tip: Put some whipped cream on top with a few cherries. Thanks again to Building Our Story for this amazing recipe.